What's a girl to do when she has Google Play and Amazon MP3 apps on her Kindle Fire and iTunes songs on her iPad and iPhone [first-world problems, I know, leave me alone!]? Well, you could do like Pop Culture Dad did and spend three days converting your entire iTunes music library to MP3s and then uploading that to Google Play, vowing to never use iTunes again... Or you could go the sane and easy route of finding a player that allows you to listen to your Google music on your iOS platforms. 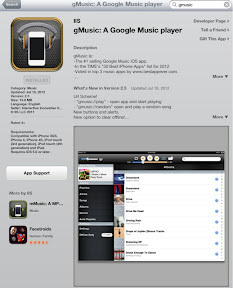 You cannot access Google Play to actually play songs from your iPad or iPhone. Go ahead. Try it. I did, and after Safari crashed several times, I finally got the message. 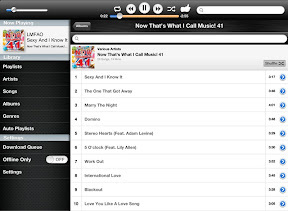 Before finding gMusic, I tried another app (a free one) which shall remain nameless. Not only did it not work, but the app had the gall to suggest I avoid ads and pay for their upgraded version instead. Considering the ads were the only part of that app that worked, no thank you. So I took a chance on purchasing gMusic. Normally, I avoid the paid version until I am sure an app will work, but for $1.99 and desperation, I thought it was worth the gamble. It was. As I type this, my iPad is blasting Lady Gaga (don't judge). Now that I feel comfortable and confident about the app's ability to work, I plan on purchasing a lot more music via Google and Amazon. Huzzah! Hey! Don't look at me like that! I haven't purchased that much from Google, and when I do it is the stuff on sale. I swear I have more… um… varied and sophisticated tastes is music!